Phil Craft, columnist for Bee Culture Magazine and former KY State Apiarist, will offer a one-day beginning beekeeper course at the University of Kentucky’s Ecological Research and Education Center (1737 Russell Cave Road, Lexington, KY). The class will be offered on Feb. 27 and repeated on March 19. An intermediate class will be offered on May 14 and again on June 25. Class size is limited and pre-registration is required. Contact Phil at philcraftbeekeeping@windstream.net for a pre-registration form or for more information. 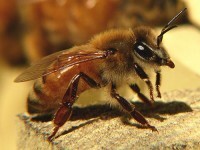 A basic beginning beekeeping course for new beekeepers – 9 a.m.- 4:30 p.m. ET, Lexington. Instructor Phil Craft offers an introduction to honey bee biology and behavior, and beekeeping equipment. The course also covers how to manage hives, where to locate a hive, purchasing bees, and potential problems of the first year. Limit 30 pre-registered participants.